"This was such an amazing tour and it was made even better by Lisa! She was incredibly..."
"I had an awesome time with Ultimate. We were lucky to have a fantastic group and..."
"Amazing trip! Would high recommend to anyone who is wanting to travel with an experienced..."
"Great tour. Linh Vo was the perfect tour guide." 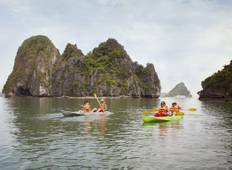 "Had a v enjoyable experience with busabout on the Vietnam and Cambodia trips. Having..."
"Overall an interesting tour. We had 3 different guides and they were not on the same..."
"This was my second intrepid tour. 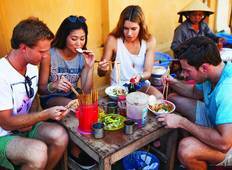 Really great tour - our tour guide Bien Tran was..."
"This trip was nothing short of amazing! Great mix of people who were all lovely...."
"This was a wonderful way to explore Biwtn without pressure we had a couple of nights..."
"It was an amazing tour, Ryan was a very easy going guide that wasn’t over bearing..."
"His enthusiasm and knowledge base are extensive. He has a great sense of humor and..."
"Highly recommend this tour, we got to see and do everything we wanted to in Vietnam..."
"Kim was a fantastic guide - informative and funny and very professional- mostly!..."